Zacuto and I discussed the needs of my shoot and we decided on the Zacuto Fast Draw with Z-Finder 2.5x viewfinder, follow focus and a few other accessories. I was ecstatic the box arrived only a few days later. That excitement almost immediately turned into dispair as I began to unpack the box. How in the world would I put all these pieces together into a functioning D-SLR video rig? I felt like someone had just sent me a Puzz 3D of Neuschwanstein Castle. Luckily there was great documentation and a few images on the web that helped guide me into successfully building what you see below. I built and deconstructed the Fast Draw several times. By the third attempt I was a pro. What isn’t shown in the photo above is the follow focus. This ingenious little device attaches to your Zacuto rig and works in symphony with geared bands attached to your lenses. The bands wrap around the focus ring of your lenses and lock into the gears on the follow focus. Instead of having to place your hand on the lens itself and perform jumpy focusing, you grasp the big knob on the side of the rig and rotate for smooth, beautiful focusing. This makes all the difference in the world. 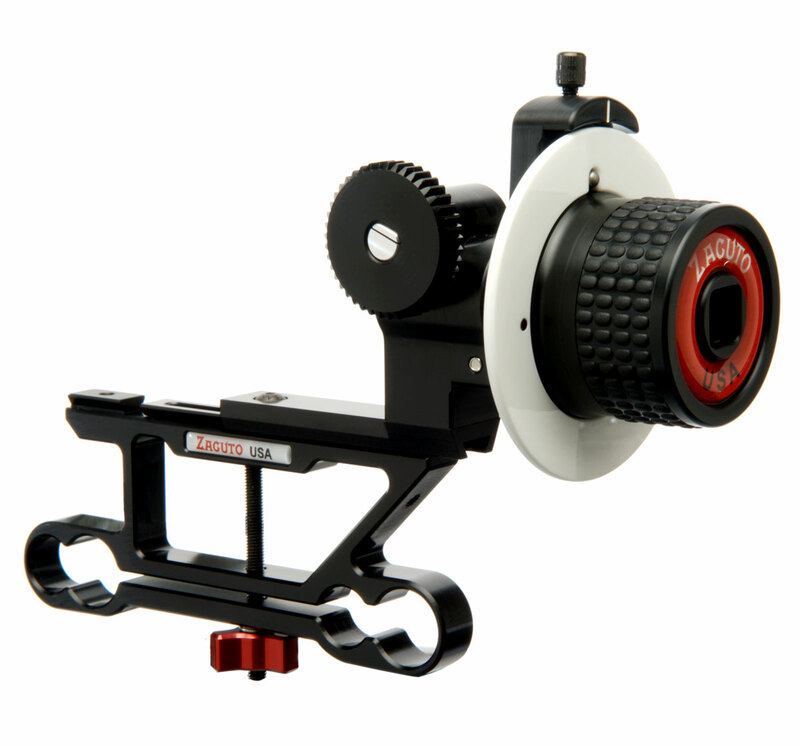 An absolute necessity to any video D-SLR system is the Zacuto Z-Finder. The Z-Finder serves a few purposes. Blocks out ambient light which would ordinarily render your LCD useless in daylight. You might have also heard of the Hoodman Hoodloupe 3 which is a similar device. I’m here to say that the Hoodman solution doesn’t hold a candle to the Zacuto Z-Finder. Yes, it costs less but you compromise a lot for that savings. Get the Z-Finder. One of the great things about this system is the flexibility. While their recommended setup worked great for me, the user is free to experiment with what works best for them. With a few designs I started falling back to my Lego days, building ridiculous setups and playing around with all the possible combination of pieces. 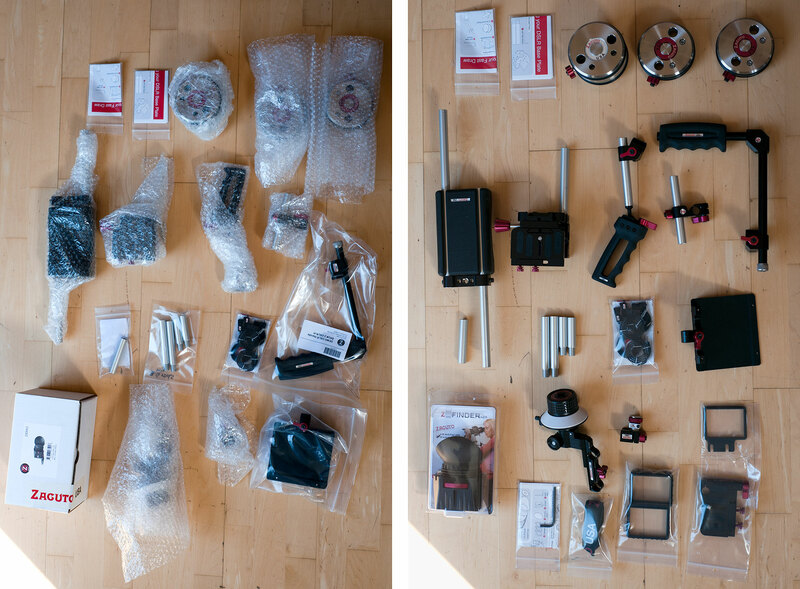 If you can dream it, there’s a pretty good chance you can build it, with enough Zacuto parts that is. The parts come together either by screwing one piece into another, tightening a sort of fly nut or using one of the included Alan wrenches. This works really well for the most part, however I would have preferred the fly nuts replaced with a quick release pin (like on a bike wheel). This would allow faster and easier modification of the setup in the field, without requiring any tools to make sure the fit is tight. On the pieces that fit together with the Alan wrench tightening a metal band around a rod, I would like a little more friction on the band. A few times, when I either hadn’t fully tightened the screw or it had gotten loose during use, parts of the rig would swing out of place. More than likely this was my fault for not tightening things up quite enough but these two changes seem simple enough that I wouldn’t be surprised if they ended up in future models. So how did it work in the field? It took a while to get used to the movements and features of the rig. The first thirty minutes using the Fast Draw felt clumsy, like your first dance at a junior high formal. Definitely play with your rig design and practice using it before heading out to shoot. Once I felt comfortable with the setup, and after a few modifications, focusing, zooming and shooting became second nature. It was like shooting with a Betacam but ten times lighter. The shoulder pad provided just enough cushioning that I didn’t experience fatigue and the counter-weights balanced the camera perfectly. There were a few times that I was tempted to let go of everything and just let it balance itself on my shoulder! I shot video from 8 in the morning and until 5 in the afternoon. I tried it out running around through fields of strawberries, in the tight confines of a packing and shipping center and at a panel discussion in a restaurant. My Zacuto Fast Draw never failed me. Had I the money and need, I would absolutely buy a Zacuto video D-SLR system for myself. About half-way into the day I began to wonder if the lighter and more portable Zacuto Cross Fire would have been a better choice. Most D-SLR camera systems are light enough that this would be all you would ever need. I think if I was shooting with a big Leica lens or one of the Red cameras, the Fast Draw or Double Barrel would be necessary. However, if you’re getting into video with your D-SLR, I can’t think of a better, more flexible and capable system than the Zacuto Cross Fire. I’ve been on the fence for a while debating whether or not to buy the Nikon D7000. It shoots great video and is affordable enough but the full-frame Nikon D700 is looking long in the tooth. I’m wondering how smart it would be to make any jumps into D-SLR video right now. 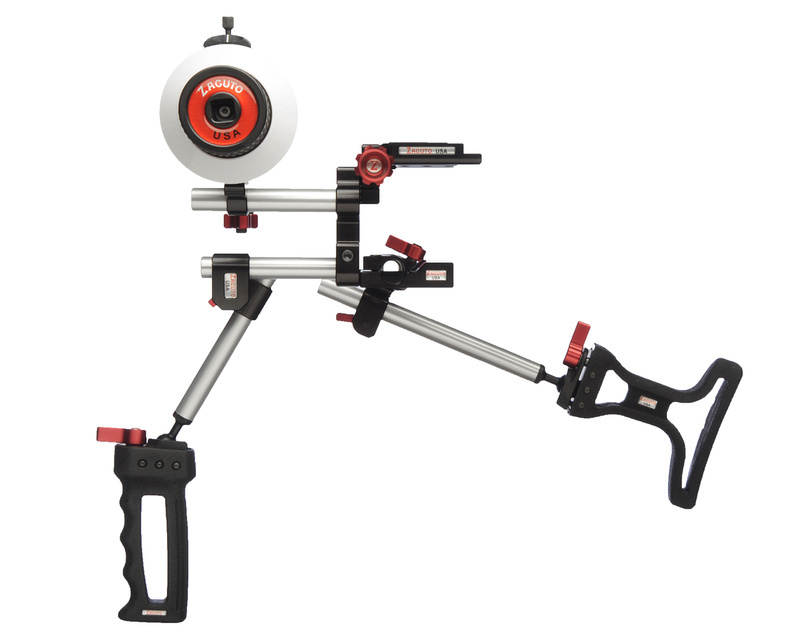 However, when that day does come, you can be sure that it will be a Zacuto rig I buy to accompany my new video D-SLR. RedRock Micro, if you are listening… feel free to send a review unit over for a fair comparison. As it sits right now, you’ve got some stiff competition! 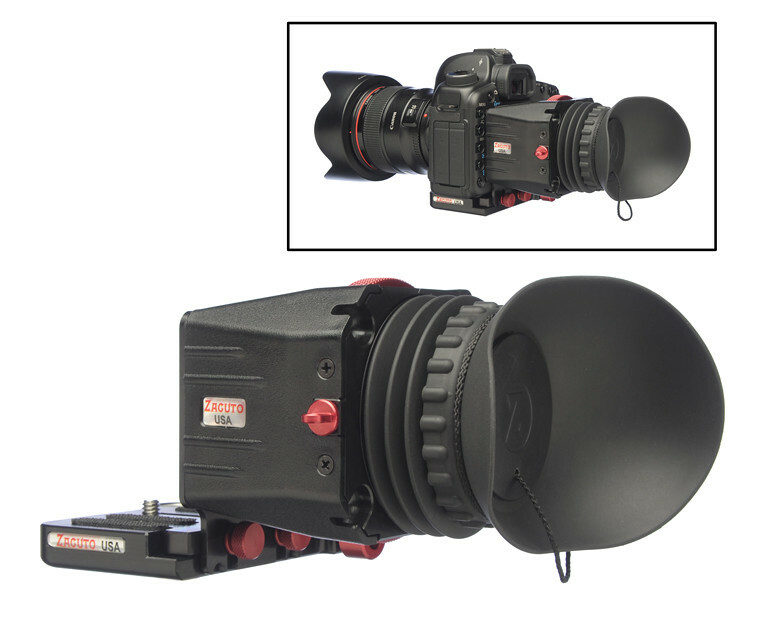 The obvious difference between the Zacuto and RedRock Micro offerings is price. The Cross Fire rings in at around $2,600 while the competing RedRock Micro Nano Stealth V with follow focus sits around $1,500. This entry was posted in Life, Nerdiness, Thoughts and tagged Betacam, Cross Fire #Z-DCF, D-SLR, D-SLR Video, Fast Draw - Zacuto, Fast Draw #Z-DFD, Fast Draw Review, HD Video, Hoodman, Nikon D7000, Red Rock Micro, Review, Video, Video Rig, Vimeo, Zack Luye, Zacuto, Zacuto Fast Draw, Zacuto Review by Justin Scott. Bookmark the permalink.